Our Authors Series brings noted baseball authors to Cooperstown for special lectures and book signings during the summer months at the National Baseball Hall of Fame and Musuem. These programs are included with the cost of admission. 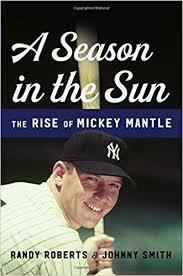 On Wednesday, June 13th at 1pm, the Hall of Fame will welcome authors Randy Roberts and Johnny Smith as they talk about their new book, A Season in the Sun: The Rise of Mickey Mantle. An essential work for fans of the game and anyone interested in 1950s culture, A Season in the Sun recounts the defining moment of Mickey Mantle's legendary career: The 1956 season, when he overcame injuries and critics to become the most celebrated athlete of his time. Taking us from the action on the diamond to Mantle's off-the-field exploits, historians Roberts and Smith depict the legendary Mantle as a complex man and character.